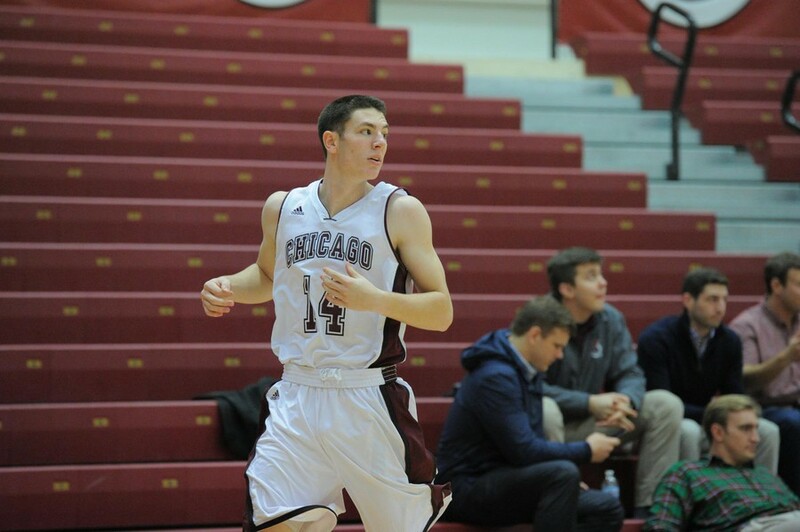 Third-year Jake Fenlon runs down the court after a possession. While the majority of the student body spent winter break at home, the men’s basketball team was hard at work. The winter break schedule featured four games, including a trip to Tennessee for the Rhodes Holiday Classic and two matchups against ranked opponents: No. 18 Illinois Wesleyan University and No. 1 Babson College. Though the Maroons ended up 2–2 over the course of the break, both of these losses came at the hand of the aforementioned ranked teams. Having played quality teams with diverse approaches, the South Siders look set for a quality run in conference play. The Maroons (8–3) had a good start to the break and the Rhodes Holiday Classic, with a rout against Monmouth College, where they led from the first buzzer to the last to clinch the game 93–77. The second game of the Classic pitted UChicago against the home team, Rhodes College. This was a fast paced, high-scoring game with both teams topping 100 points. The Maroons went on to win 121–101, with 121 points being the highest the team has managed since the 1995–96 season. The Maroons came back from Tennessee on the back of an eight-game winning streak to face No. 18 Illinois Wesleyan on the road. However, Chicago’s momentum was halted as the Titans came out on top 72–54. The last game of 2016 featured a big match up, pairing the Maroons up against No. 1 Babson College. The final score of 82–70 did not do justice to how well the Maroons played. They led for the entire first half and well into the second half, and were only undone by a spectacular 21–6 run by Babson in the last six minutes. Though the Maroons are coming off two tough losses, they were both hard fought games against high quality opponents. Fourth-year Waller Perez feels that these games have prepared the team for the rest of the season. “Over break, we had a couple of games where we played teams that had drastically different styles than what we’re used to. I feel like those games helped prepare us for our tough conference schedule,” Perez said. The Maroons look to start conference play on a high note on Saturday with a big game against the rival Wash U, ranked 24th. This will mark the 70th meeting between these two teams who both come into the contest with a record of 8–3. The fact that both teams have had successful starts to their respective seasons makes this game even more special.